Two Castles Run - Done! 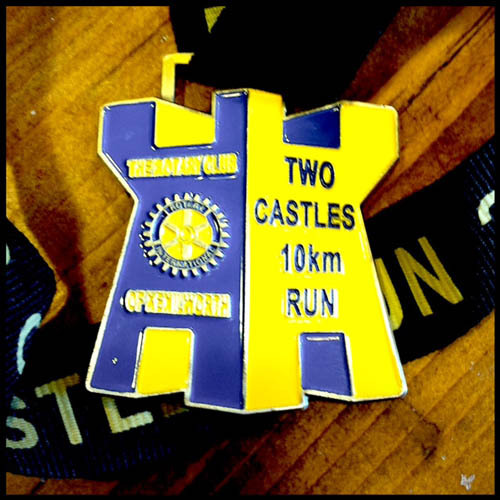 Two Castles Run – Done! It’s not very often I choose to get up at 5 a.m. on a Sunday, but this morning I was up and out early to take part in my 7th race of the year, the Two Castles Run 2013. Today was the 31st Two Castles Run, a 10k race that starts inside Warwick Castle, Warwick and finishes inside Kenilworth Castle, Kenilworth. For me, it was my first serious run since the Edinburgh Marathon and despite doing very little running in the last 2 weeks I managed another personal best, completing the race in 46 minutes and 39 seconds and finishing in position 373 of 2052 male runners. I now have 5 weeks until my next race, the Great British 10k. Hopefully with some focused training I can get another personal best. The other big news from today is that I have now completed the first 1,000 miles in 2,013 miles in 2013 challenge. I am my 2013 miles in 2013 challenge in aid of the Cystic Fibrosis Trust. I have been surprised since I started fundraising for the CF Trust just how many people are unaware of this disease and so I hope my efforts will not just raise money, but also awareness of the UK’s most most common life-threatening inherited disease. The first person to commit to sponsoring my 2013 mile challenge has committed to 1p per mile (£20.13 in total) and this got me thinking. I am hoping that as many as possible of those reading this will commit to do the same and the best thing is, if each person does this on a “pay as you go” type approach all you will need to part with is approx £2 just after each pay day. In January I completed 205.9 miles, in February I completed a further 200.9 miles, in March I completed 185.7 miles, in April I completed 192.1 miles and in May I completed 168 miles. If you can please spare £9.53 to help the Cystic Fibrosis Trust it will be greatly appreciated (as will any other contributions).